Sequoia Capital used this RIP image in 2008 to warn its portfolio companies about the rough ride ahead. This month's economic jolts could be the start of another grim period. NEW YORK (CNNMoney) -- Back in 2008, Sequoia Capital -- one of Silicon Valley's venture-capital kingmakers -- held an emergency, all-hands meeting for the 100-plus startups in its portfolio. Its purpose: To outline the grim times Sequoia saw coming. "It's always darkest before it's pitch black," Sequoia partner Eric Upin told the gathered troops. He underlined the point with a now-famous PowerPoint deck that tech wags dubbed the "ultimate panic memo." 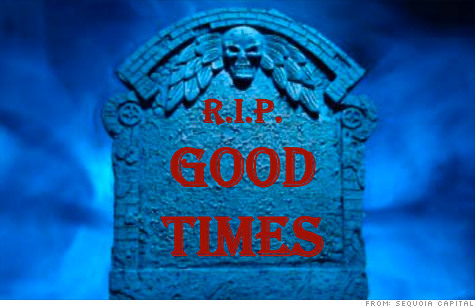 The 56-slide presentation opens with a gravestone labeled "RIP Good Times" -- and gets worse from there. Last week, as the stock market plunged and swung, the same tremors spread through the tech industry's startup community. The question popped up in blogs, tweets, and happy-hour chatter: Is 2011 about to turn into 2008? Is all the bubbly momentum -- angel investors fighting for a sliver of hot deals, venture capital gushing forth at soaring valuations, and lots of M&A action -- about to freeze up? Or, as Lean Startup author Eric Ries put it: "Winter is coming. Entrepreneurs should be prepared." Ries' words riffed on an epigram threaded throughout George R. R. Martin's bestselling Game of Thrones series, which is practically required reading for the tech tribe. His message: Startups need to batten down the hatches. Anyone planning to raise money, invest heavily or make major product changes in the next few months should accelerate their timeline and do it right now -- because the window of opportunity could slam shut. It's a message other powerful voices are also spreading. "If you are running a company that needs to do a venture round soon, I highly recommend that you get it done ASAP," Union Square Ventures partner Albert Wenger wrote recently on his blog. "I believe that the probability of a dip that could be as big as 2008 or even bigger has gone up tremendously in the last few months." "There's a general fear that I sense in the past few weeks," one recent grad of a high-profile Silicon Valley incubator told CNNMoney. "The second the market tanked, everyone was like 'how should this affect us?' Everybody is starting to worry a little about it." The entrepreneur -- who asked not to be named because he's currently courting advisers and investors -- had initially planned to hold off on raising money. But after polling his small staff for their votes, he said he'll likely take the plunge and do it now. "Everyone who has been through this says 'you should just do it,'" he said. "Winter" is nothing new in the world of tech startups -- and those who have been through it before say they're feeling a chill in the air. Weak startups, and the investors that funded them, are starting to flounder. Exhibit A: This week's strange case of Blue Noodle, a Toronto-based social gaming ad services firm that abruptly ceased operations and quit issuing paychecks. "This will be my third winter," said industry veteran Danielle Morrill. "If you're going to do startups for the long term I think you have to learn to weather this over and over again." During the 2001 dot-com bust, Morrill was working at her family's financial services firm. It took a big hit in the post-Sept. 11 fallout. She later joined Pelago, a pioneering location-based recommendations engine that launched in 2007 -- right before the Great Recession set in. "That company kind of boomed and busted," she said. "Traction wasn't going anywhere." She quit in 2008 -- at the height of the financial crisis -- to move to cloud communications startup Twilio, where she currently works as director of marketing. Pelago was sold to Groupon earlier this year. Twilio is in good shape, Morrill says, but if the economy stays so volatile, she expects liquidity to be an issue for newer startups and the venture capitalists that fund them. Take note, entrepreneurs: The storm clouds are gathering.